On the full moon day, the Tibetan 15th (March 12, 2107), there was a ceremony to celebrate the nuns who took the shramaneri vows at the Mahabodhi Stupa. 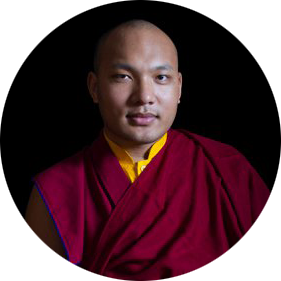 The Karmapa reprised his talk there, as he wished to say more about his thinking on issues related to full ordination for nuns. “As I have mentioned before, in Tibetan history during the time of the Dharma king Trisong Deutsen when the first ordained Sanghas were established, there were six or seven princes who went forth and the monastic community was established. Previous to this, we can probably say that there were monastics in Tibet, as monks from China and India stayed at Samye; however, there were probably no Tibetans who were ordained before then, though this needs more research. That said, it is clear that when the first Sangha was established, there were both ordained men and women (rab byung po mo gnyis ka). “After this, especially during the early spread of the teachings, the histories do not describe clearly the situation of nuns: We do not know how they flourished or how they decreased. For the later spread of the teachings, we have histories from the Sakya lineage, which include the Documents about India and Tibet (rGya bod yig tshang chenmo for the short title and rGya bod yig tshang mkhas pa dga’ byed chen mo for the long one) and also a Brief Account of the Familial Lineages of the Glorious Sakya (dPal ldan sa skya’i gdung rabs mdor bsdus). In these texts it is written that women went forth, and not only that, among them were bhikshunis (fully ordained nuns). “But we should not spend too much time focusing on Tibetan history. The bottom line is that there was no continuous bhikshuni Sangha or the transmission of these vows in Tibet. This then raises the question: What would be the problem if there were no bhikshunis? The greatest fault is that according to the vinaya, when vows are given to women, bhikshunis are needed to ask them the questions about their previous going forth from their homes and about the present ceremony to take shramaneri vows (when they are asked about obstacles etc.). “Bhikshunis are needed whether we are speaking about the vows of the upasika (dge bsnyen or lay woman with precepts) or the ordaining vows (rabtujungma), including those of the shramaneri (dge tshul ma or novice nun) and the shikshamana (dge sblob ma or nun in training). Likewise, a Sangha of bhikshunis is necessary when the bhikshuni (dge slong ma or full ordination) vows are bestowed. Therefore, if there were no bhikshunis, it would be difficult to give the vows to women in a proper and authentic manner as described in the vinaya. In Tibet, the bhikshus (fully ordained monks) substituted for the bhikshunis in giving the vows for ordination. Whether these are authentic vows and whether they were properly given is a question to be examined. “In the Buddha’s words, it is said that if there are no bhikshunis, the bhikshus could give the vows. Later the great scholars who followed the Buddha’s teachings in composing their treatises wrote in a similar vein. The Kadampa tradition of Tibet treasured the practice of the vinaya and kept their distance from the mantrayana. In the writings of these Kadamapa masters of the past, it is said that if there are no bhikshunis, the bhikshus can give women all the vows they need. Likewise, in the Mahaprajnapati Sutra, the Buddha said that a male, such as a bhikshu, khenpo, utpadaya, or an archarya, may give women vows. “So then we have to look and see if there are bhikshunis in the world or not. In the past, the world seemed huge but now everything has come closer; the planet has transformed into a big global village where we all have connections with each other. So the world is different from what it was the past. Previously, if you said there were no bhikshunis in Tibet, it meant there were none in the entire world. But now, the world has become smaller, and we are able to look to see if there are bhikshunis in the larger world or not. When we do so, we can see that in the Chinese tradition, there are indeed bhikshunis. They may belong to the Dharmaguptaka tradition, which is different from the Tibetan vinaya in the Mulasarvastivadin tradition, yet undeniably, there is a Sangha of fully ordained nuns in China. Due to this, there is a hope or a basis for being able to restore the vows of full ordination for women. “In Tibetan Buddhism we may not have fully ordained nuns, but we do have nuns who have gone forth and ordained, the shramaneris or novices. These vows were given by the bhikshus of the male Sangha, and if there were no other choice, we could restore the full ordination for nuns through them. If we were to do this, however, there would be the question of whether or not this was the most excellent and perfect way of giving the vows. If we could not do it perfectly, then we would have to go through the male Sangha but I think we need to make efforts to do it properly and perfectly. For that reason, this year we have invited bhikshunis from the Dharmguptaka tradition, and they have given the vows of going forth (rabtujung) and the shramaneri (dge tshul ma or novice) vows in order to establish a foundation for the vows (of full ordination). My hope is that this will work out perfectly and be the best way of doing it. “Some people might think that we are making these efforts to restore the full vows due to the influence of western nuns. But the purpose is as I have described before: without a Sangha of bhikshunis, it is very difficult to give proper and authentic vows to individuals in a female body. This is why it is extremely important to reinstitute the community of bhikshunis. 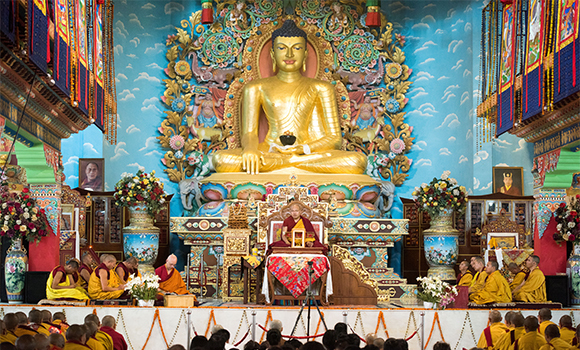 When we look at the ceremonies for the vows that can be taken with a female body—such as a female lay practitioner with precepts, the female who has gone forth, and the novice nun—as they are described in the vinaya (and many of the ceremonies have been translated from Sanskrit into Tibetan), they all state that the bhikshunis should bestow the vows that can be given to women. If we seek these authentic true vows, then the bhikshunis are key.